The Thungyai and Huai Kha Khaeng Wildlife Sanctuaries hold an unusal mix of species from four different biogeographic zones: Sundaic, Indo-Chinese, Indo-Burmese and Sino-Himalayan. 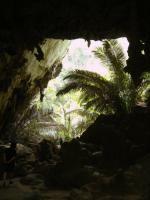 The area is large and undisturbed enough to support the survival of elephant and tiger. The presence of mineral licks also is profitable for wildlife. These two contiguous parks are located in the northwest of Thailand along the Burmese border. 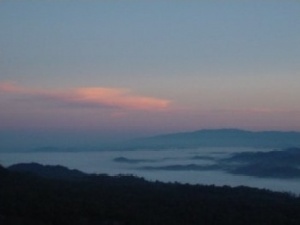 Thungyai is predominantly mountainous, with rivers and a central grassland plain. Huai Kha Khaeng is hilly and has five types of forests. Thungyai is inhabited by tribal people, including Hmong. The first problem regarding our intended visit to Thungyai - Huai Kha Khaeng Wildlife Sanctuaries (HKK) was where exactly to enter this very large site, most of which is remote and inaccessible. The 2014 map on the UNESCO web site is described as a “Clarification”. It may indeed be better than the even worse one of 1990 but is pretty useless for identifying roads which go into the inscribed area or even for relating the park boundaries to those on other maps which did show roads such as Google or our paper “Reise Knowhow”! In the end I found this (and click on “Open Map”) which showed just 2 entry points to HKK from the East. These would seem to be the same as those referred to by Frederick Dawson in his review below. The northern entrance leading to the park HQ (marked “I”) on this map fitted in well with our general driving route from Mae Sot, through Khamphaeng Phet (part of Sukhothai WHS) and on south towards Ayutthaya, and also guaranteed that we would have entered the inscribed area. Whether it would provide “good” wildlife viewing only time would tell.! We did consider whether to enter the Thung Yai element of the WHS (situated contiguous to HKK to its West) which may be more “scenic”. As Frederick also indicates, it does appear that official entry is possible from the North at the end of the 1090 road 50 kms south of Umphang. This road is described as “partly paved” (but ok without 4x4) here. Unfortunately we didn’t have time for this long trip south of Mae Sot on a “cul de sac” road which thereby required a return. Finally, although the above link doesn’t mention it, it seems that there is (at least) a 4th way into the WHS from the South along Route 323 towards the 3 Pagodas Pass and then off along road needing 4x4 - search on the Web for “Takien Thong Waterfall”. This may or may not be the same entrance as that described by John Burrell below. By 8.30 am we were at the Park entrance barrier (15.588505, 99.387430 ) and paid our entry fee of 200 baht each plus 30 for the car. Thailand operates different levels of entry fee for its different parks (all with a big “Foreigners upgrade”) - Kao Yai is at the highest level at 400B pp and Kaeng Kratchen is the next at 300B pp so HKK is relatively “cheap”!! The entry station had a small “exhibition”, mainly in Thai, but one of the boards showed a park road and trail map. Despite the high fees charged to foreigners, no printed information was provided about the park, so we photoed this for “future use”! A plus point was that the entrance and visitor centre were well provided with UNESCO logo signs to “prove” that we were indeed entering the WHS!! We knew of course that the way in which we were visiting Thailand’s natural WHS wasn’t optimised for seeing their wildlife - less than a complete day in each with a post-dawn arrival and a departure around dusk at latest, but, at Kaeng Kratchen and Khao Yai, one could at least see that there could have been ways to achieve better wildlife sightings if we had chosen alternative ways of visiting by staying longer, having a 4x4, hiring a guide etc. It might be worth noting that Thung Yai/HKK consists of 2 areas designated as “Wildlife Sanctuaries”. This is in fact a more strictly protected area than a National Park, so, it is perfectly reasonable to make large parts of it totally or virtually “off limits” to visitors, but a big disappointment for us about HKK was that Thai National Parks had closed even those limited visitor facilities which it had provided! After the payment point, the asphalt road was replaced by dirt - but perfectly ok for our saloon. We immediately left the agriculture behind and entered secondary forest. In the distance lay the ridges of primary growth which were the real heart of the reserve - but these would remain inaccessible. Signposts along the road warned of Tiger and Elephant - with pictures of them, for those who didn’t speak Thai!! With no such sightings we concentrated on birds. One claim by HKK is that “No where else in the world is known to support as many woodpeckers” and we certainly had fine views of some. After 9kms we reached the park HQ and car parks - this was as far as we could go by car. The HQ area was, in many respects, a revelation. It represented a big investment and had obviously been created with care and even “love” by those who had designed and built it. There was a beautiful camping area surrounded by attractive colonial bungalows with twin rooms and parking area (though whether these were intended for rental by visitors or were for sanctuary workers wasn’t clear). Nearby was a café with a nice shady viewing area overlooking a stream. Slightly higher was a pleasant building designated as “the Exhibition Building of World Heritage Site”. A fine suspension bridge crossed the river where there was a further complex of modern tourist-related buildings - about which more later. Unfortunately everything seemed to be closed!! Due to lack of anyone speaking English we weren’t able to find out at the time why this was, but subsequent Web searches state that “The campsite and the canteen are closed due an incident with an elephant injuring a camping tourist in tent. Tourists are advised to bring their meals and water/beverages with them.” Further searches on the web have identified that this occurred in April 2016 and also that there seem to be no plans to reopen the Camp Site. In retrospect this also explains the remarkably cagey approach exhibited by the staff to our intention to step out along the walking trails which led from the camping area - one of which glories in the name of “Home of the Tiger Nature Trail”!!! In fact this was only 800 m long, rather less than some of the other trails, which were clearly described as requiring an accompanying guide. Along it is a rather fine 3 story viewing tower overlooking a clearing with a water hole. At this point we were surprised to discover that we were being “tracked” by a couple of sanctuary workers! As we climbed the substantial metal circular staircase to the top floor of the tower we couldn’t fail to notice that it had acquired a rather awkward “kink” at the bottom. Gesticulation to one of our minders confirmed that this had been done by an elephant – though whether it was just scratching its side or in pursuit of a tourist wasn’t clear (Just joking!). We completed the walk without seeing anything of note. In fact we spent the heat of the day in the camp/restaurant area and did see what, for us, was a new species of Antelope - the Thamin (aka Eld’s or Brow Antlered Deer) - photo. We were the only foreign tourists and, even on a pleasant Sunday at the start of Dec, the only Thais in the park seemed to be a few families enjoying a picnic by the river. We later crossed the river to the other set of buildings. At which point, the role of Seub Nakhasathien (1948-90) both in HKK and within Thai consciousness needs to be introduced. This extract from Wiki gives a flavour “a Thai conservationist, environmental activist, and scholar who is renowned for his effort to protect Cheow Lan Lake … and Thungyai–Huai Kha Khaeng Wildlife Sanctuaries. Seub committed suicide to signify the importance of the environment and to preserve it.” (see - link .) A reading of the Wiki biography will give sense of the hagiography which now surrounds him and his life. He is presented as a “Martyr” for environmentalism - worn down by the fights with Thai bureaucracy and business and “choosing” suicide as a means of publicising the problems of corruption, illegal logging and hunting, lack of interest and money from government etc. I have been told that the reality of his death is rather more complex but can find nothing on the Web to support any more nuanced view. He is also credited with pushing for HKK to be inscribed as a WHS and in producing a large part of the Nomination File (Elsewhere credit for this is also given to Belinda Stewart-Cox, a UK Naturalist who worked with SN). A few dates :- 1989 – SN became Superintendent of HKK, Sep 1 1990 - suicide by shooting, Jan 1991 - IUCN Field visit, Apr 1991 - IUCN report favouring inscription, Dec 1991 - Inscription at WHC. Within days of his death, the Seub Nakhasathien Foundation (SNF) had been set up to “To promote the conservation and protection of forest, wildlife and wild places of Thailand for the sustainable benefit of nature and” See - link. The SNF then constructed the “Seub Nakhasathien Memorial” at HKK HQ (opened April 93). It consists of a landscaped area containing an open sided educational building which now doubles as a location for storyboards extolling SN, a statue of the man (suitably attired in forest exploration mode! ), a memorial to rangers killed in the fight to preserve the wildlife of HKK and, finally SN’s bungalow kept as at his death. This article written by Ms Stewart-Cox in 1998 on behalf of SNF might be of interest in providing an insight into the problems faced by those trying to preserve HKK’s largely pristine state. We completed our time in HKK with a slow drive out and, as well as more birds and some macaques, did see an Asiatic (or “Golden”) Jackal – not particularly rare but I don’t think we had ever seen this Jackal species before. So - was our visit worthwhile? Well, we got the tick and certainly have a better understanding of a WHS of undoubted OUV which, without even this limited visit, we probably would never have acquired. In all honesty however, HKK is not (and is not intended to be) set up for visitors/tourism. I fully understand why, unlike Kaeng Kratchen and Kao Yai, it doesn’t figure as a destination in commercial nature tours of Thailand. Huai Kha Khaeng is the most underrated WHS in Thailand. Why? This heritage place is not the tourist attraction! It is the eco study room and largest rain forest in Southeast Asia for everyone. In the area of HQ comprises of office, staffs accommodation, canteen, campsite and exhibition building. They allow very limited area for visitors. 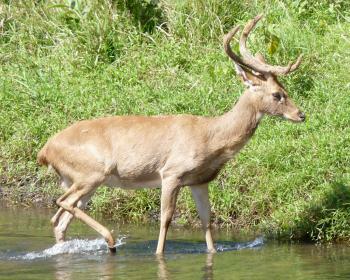 There is a creek run through it and deer herds among the forest. Thai people have known this place very well although a few have been there. Former head of the sanctuary committed suicide in his house in the HQ compound to save this forest from many causes ie dam development and so on. His dedication have brought the consciousness of nature preservation to Thai society. So today Huai Kha Khaeng is saved from the greedy. For the country that tourism industry developed so well, it was quite surprised to discover that visiting Huai Kha Khaeng and Thung Yai were still almost unknown by tourist standard in Thailand even with the UNESCO World Heritage Site logo guaranteed. In 2009 with my friend we traveled from Malaysia to Northern Thailand with stop en-route at the peaceful town of Uthaithani. We managed to hire local van to bring us to beautiful town of Lan Sak where the Huai Kha Khaeng's forest ranger HQ located. At the office we pay 200 Thai Baht as the entry fee, here there were many trekking routes to see the forest to chose, the forest was OK with some bird, but there was no significant attraction. A ranger recommended us to visit Cyber Falls (very unusual name!) and Hoop Pa Taad Valley, so we continued our trip to the waterfall which located in other part of the Huai Kha Kheang about 40 minute drive from the HQ office, after 2 kms trekking and river crossing from the entrance, we reached the waterfall, the waterfall was quite lovely but nothing grand or spectacular, but compared to the trekking route at forest ranger HQ, the latter one was far better. Then we went to Hoop Pa Taad Valley, not part of Huai Kha Khaeng but the adjacent buffer zone, but for us was the real highlight, the valley was located in the middle of limestone mount, we need to walk through the small cave to reach this hidden valley. Inside the valley was like a small Jurassic forest with many beautiful tree and dripstone, I highly recommended to visit this place more than Huai Kha Kheang! But maybe I was just visit the outer zone of this forest complex, to visit the inner zone; we need 15-30 days in advance contact the ranger office or Department of Forest in Bangkok for special permit, and to the best of my knowledge, all paper work and contact point were Thai, so we need local travel agent to deal. After Huai Kha Khaeng, we continued our trip to the small town of Um Phang in Tak Province located deep in the forest in Western Thailand almost near Burma border. Going to Um Phang was quite amazing; along the road were many beautiful jungle, waterfalls and hill tribe villages. The reason to come to Um Pang was to see Tee Lor Su Fall, the biggest waterfall of Thailand, located in Um Phang Wildlife Reserve next to Thung Yai WHS site. We had to take a raft along the river, passing many pretty waterfalls, and my guide claimed that some area along the river was part of Thung Yai. Finally we reached Tee Lor Su, the waterfalls was really big and truly spectacular, better than any waterfalls I saw in Thailand. It was quite confusing some book even Lonely Planet in some edition claimed Tee Lor Su was part of WHS, but when I was there I saw no single WHS symbol, quite contrast to Huai Kha Khaeng. But for sure was Um Phang and Tung Yai were under the same ecosystem. Similar to many important natural WHS, visit the inner core zone of the protected area was quite almost impossible, but the places I saw in outer zone and buffer area of Huai Kha Khaeng and Tung Yai were quite amazing, especially Tee Lor Su and Hoop Pa Taad Valley, and not to mention fascinating culture of hill tribe people along the way to Um Phang. Western Thailand was just amazing place to visit and Tung Yai - Huai Kha Khaeng was a good World Heritage Site to enjoy. I've been here last X'mas and stayed overnight.basically entering there but educational and scientific study and some eco tour that is managed by NGO especially burmese refugee suport organization.very beautiful place,if you're lucky,you could see wild peacock and tiger!in the rainy season rivers overflow with much rain.i recomend you wake up early and see fog sea from the mountain. Famous suicides: Huai Kha Kheng - The suicide of Head Ranger "Seub Nakhasathien" as a cry for help from society and public authorities to seriously solve natural resources problems.